President-elect Donald Trump woke up Friday in Blair House, the President's Guest House only steps from the White House, to begin a carefully choreographed ritual leading up to the peaceful transfer of power as he takes the oath of office at noon as the 45th president of the United States. 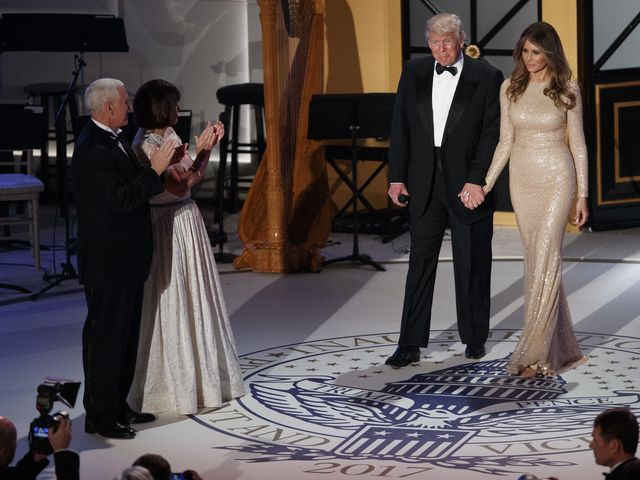 At 8:30 a.m., Trump and his wife, Melania, will attend a prayer service at St. John's Episcopal Church, known as the "Church of Presidents," on nearby Lafayette Square before joining outgoing President Obama and first lady Michelle for tea on the South Portico of the White House. 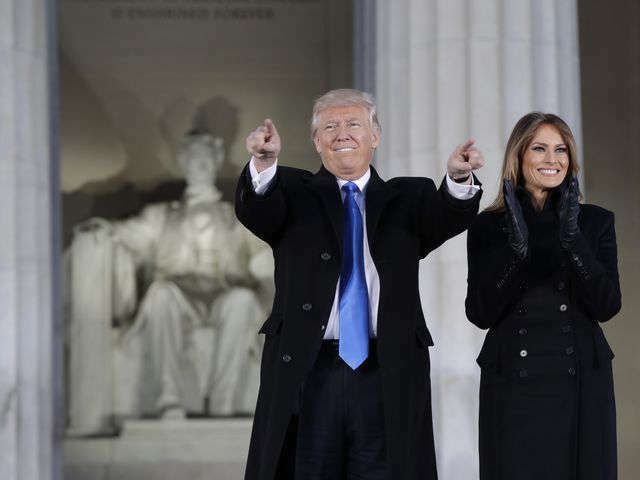 At 10:30 a.m., as moving vans and decorators rush to transform the Obama White House into the Trump White House, the two couples will travel by limo down Pennsylvania Avenue for the formal swearing-in ceremony on a specially built platform on the West Portico of the Capitol overlooking the National Mall. The ceremony — including a formal address by the new president and the swearing-in of Mike Pence, a former Indiana governor and congressman, as vice president — marks the end of an exhaustive, combative campaign in a bitterly divided nation. Trump, a brash billionaire real estate mogul making his first run for public office, stunned the political establishment by sweeping to victory and beating his Democratic opponent, Hillary Clinton. But he takes office with an approval rating of only about 40%. Despite a forecast of rain, as many as 900,000 people — including thousands of protesters — are expected to witness the handover of power from eight years of Democratic rule to a Republican president. Thousands of people began jamming into the area before dawn, maneuvering through police barriers and metal fences erected to provide tight security. In a sign of the peaceful transition, three of the four living former presidents, George W. Bush, Jimmy Carter and Bill Clinton, will be on hand for the swearing in. Only 92-year-old former president George H.W. Bush is unable to attend, because of health reasons. Hillary Clinton is also scheduled to attend the ceremonies. More than 50 Democratic members of Congress, led by Rep. John Lewis, of Georgia, however, said they will boycott the inauguration for a variety of reasons, including allegations of Russian involvement on Trump's side in the election. 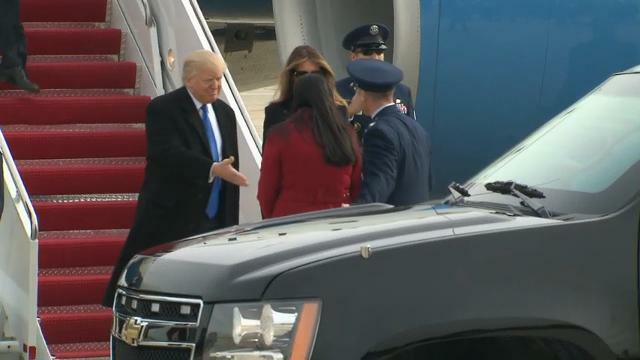 Trump, accompanied by his wife, arrived in the nation's capital Thursday for an overnight stay at the Blair House, where incoming presidents traditionally spend inauguration eve. After the swearing in and the ritual drive down Pennsylvania Avenue from the Capitol to the White House, the Trumps will settle in to observe the inaugural parade that passes in front of their new residence. 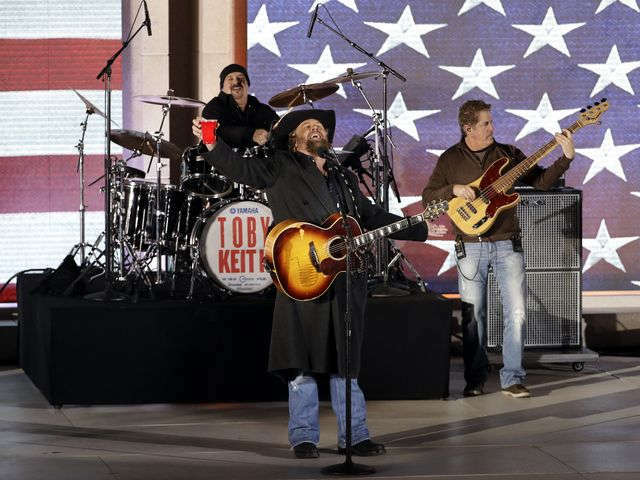 The two days of ceremonies kicked off Thursday with Trump laying a wreath at Arlington National Cemetery, followed by a "Make America Great Again" concert and rally at the Lincoln Memorial featuring country singers Toby Keith and Lee Greenwood. Also performing: Jackie Evancho, The Mormon Tabernacle Choir and the Missouri State University. Celebrities such as actor Jon Voight will be in attendance. In another sign of the post-election strains, the Trump team was unable to attract top entertainers for the concert, while some pulled out at the last minute, citing public pressure. The transition team, however, cast the proceedings as deliberately low-key, aimed at "the people." Although Friday marks the end of the major inaugural ceremonies, protesters plan to take the stage on Saturday with demonstrations by an expected 200,000 people, with the largest group participating in the Women's March on Washington. 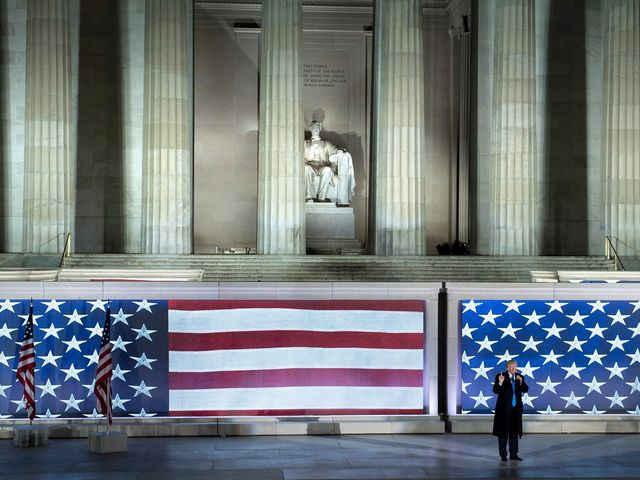 On Friday, one protest march, which organizers are calling a “Festival of Resistance,” will travel about 1.5 miles to McPherson Square, a park about three blocks from the White House, where a rally including filmmaker and liberal activist Michael Moore is planned.